When Darlington went into administration in 2009 – the second of three times the club has now done so – they owed HMRC tax arrears of more than four hundred thousand pounds. As part of the deal that led to them coming out of administration, unsecured creditors, including the tax man, received 0.0009 per cent of what was owed to them. In Darlington’s case on this occasion, they owed tax of £404,376 in tax – and paid £3.64. 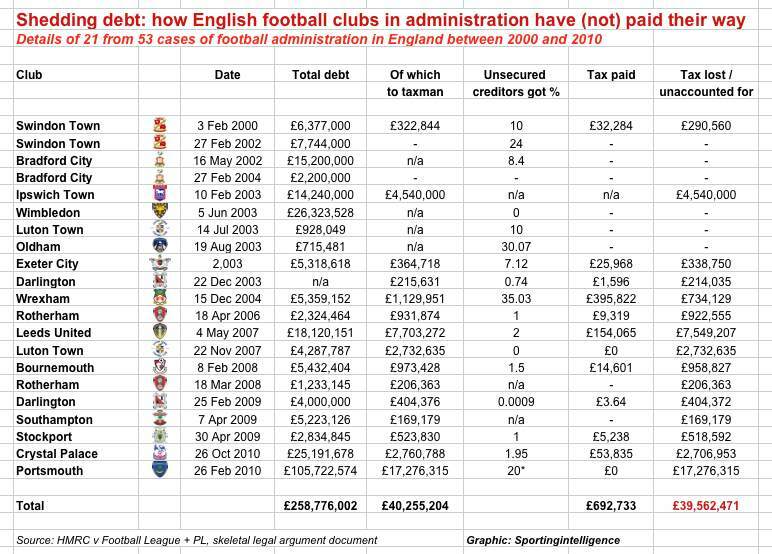 This is just one of the extraordinary facts revealed in an official HMRC document about the financial knock-on effects of English clubs that go bust and leave huge debts behind. Sportingintelligence has obtained a leaked copy of the 106-page document (extract left, click to enlarge it), which was prepared by HMRC for its ongoing legal battle against the Football League and Premier League to have the ‘Football Creditors Rule’ scrapped. This rule allows bust clubs in England to guarantee some creditors (“football creditors” such as players and other clubs) t0 be paid in full while other creditors get just a few pence in the pound, or nothing. Between 2000 and 2010, there were 53 incidents of clubs in England entering administration and the HMRC document includes official breakdowns of what clubs owed in 21 of those cases. As our graphic below shows, 15 clubs owed a total of £40.26m to the taxman – and more than £39.5m has never been paid or remains unaccounted for in those cases alone. 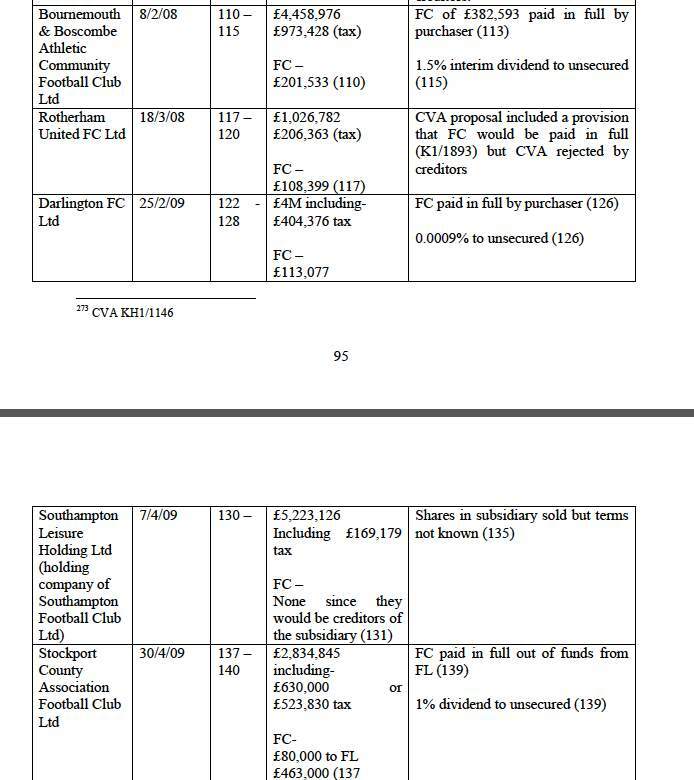 Darlington’s £3.64 repayment in 2009 came after they’d previously committed to paying only £1,596 of a prior £215,631 tax bill in 2003. The biggest tax debtor on the list is Portsmouth, from their last administration (not the current one), when £17.3m was owed. Informed sources say that although Pompey agreed to pay 20 per cent of that back over time, not a penny has actually been paid. Leeds United, meanwhile, agreed to just pay two per cent of a £7.7m tax bill in 2007, shedding more than £7.5m tax liabilities in the process. It was in 2002 that HMRC lost its ‘Preferential Creditor Status’, meaning it became an outside party alongside the likes of small local traders and the St Johns Ambulance service – all of which are often paid next to nothing. The full loss to the taxpayer will be much higher than £39m when all 53 cases are considered, not to mention non-English cases; infamously Rangers are awaiting the outcome of their ‘big tax case’ in which HMRC is claiming tens of millions. Sources north of the border expect some form of compromise on repayment of that, as and when a ruling is made on precisely what Rangers owe. There were 53 incidents of clubs entering administration from 2000 until November 2011, and already this year Portsmouth, Port Vale and Darlington have entered administration, as have Rangers. Football finance expert Professor John Beech, from Coventry University, said: “The return to the offensive against football clubs mounted by HMRC since 2009 is hardly surprising and neither is their fight to see the Football Creditors Rule overthrown. “Seeing the taxman as a soft touch for what is in effect an easy overdraft is neither good business practice nor fair to other taxpayers. “Failure to hand over VAT promptly strikes me as particularly indefensible. After all, the money has been collected on HMRC’s behalf”. HMRC are currently waiting for the High Court verdict on the Football Creditor’s Rule after opening a case against the Football League last November. A decision is expected over the next few weeks. Speaking at the case last year, HMRC’s Gregory Mitchell QC, said: “Whenever the football creditor rule is applied, there is always a loss to the taxpayer, which is why we bring these proceedings”. He added that the football creditors’ rule represented “the ugly side of the beautiful game”. The Football League has argued that unlike Premiership football players who are paid millions, the football creditor’s rule was set in place to protect players’ earnings in the lower leagues. However Professor Beech adds: “The defence of the Football Creditors Rule that is habitually trotted out – that the integrity of the league must be maintained – is unreasonable in my opinion. “I don’t see how the existence of the rule can be justified as a means for buying and selling players on credit when the buying club is well known to be on shaky financial grounds, and the selling club can, in effect, expect the public purse to act a guarantor for payment. “The rule is shameful, and reflects extremely badly on the whole football club business sector. In my view it’s counter-productive as it’s one of a number of factors that have contributed to the spiraling cost of transfer fees, which is hardly helpful to clubs”.